Travel Oregon is a multi-platform digital marketing initiative aiming to dynamise tourism in the Beaver State. Via influencer marketing and crowdsourcing, Travel Oregon manages to get a permanent in-stream of fresh content to share. The initiative especially focuses on Oregon’s 7 Wonders: the landmarks that make the region especially attractive to outsiders. Travel Oregon's launch strategy involved leveraging the reach of influencers at a time of year when our research indicates is the most ideal for inspiring travel to the state. So, Travel Oregon brought together Instagram influencers with local Oregon ambassadors to create the ultimate social influencer tour to highlight Oregon’s 7 Wonders and the surrounding areas. By all accounts, the program was a huge success. The influencers, who were each chosen based on their mix of large social followings, photography skills and interest in traveling to Oregon, posted a total of 111 stunning photos to the Travel Oregon Instagram account. Many of the photos were also shared across other social platforms, amplifying their reach. Each week for seven weeks, an influencer explored a Wonder and the surrounding area, participating in relevant activities along the way (e.g., hiking to waterfalls in the Columbia River Gorge). The influencers documented their experiences from their personal Instagram accounts, as well as by playing the role of guest Instagram photographer for the Travel Oregon. In addition to the influencers, locals were chosen to show each Instagrammer the hidden wonders of their regions. The locals were a mix of individuals with Oregon brands / businesses and specialty interests (e.g., brewers, chefs, surfers, Tillamook Cheese) who have a strong social presence. The goal was to showcase the complete “Wonder package” and create complete itineraries users can adopt. The tour has generated 9,916 new fans/followers on Instagram so far. Each influencer was successful in driving fan growth and creating engaging content on the Travel Oregon Instagram page. Average fan growth during the tour for each influencer was 12.31% and engagement was at 8.57%. 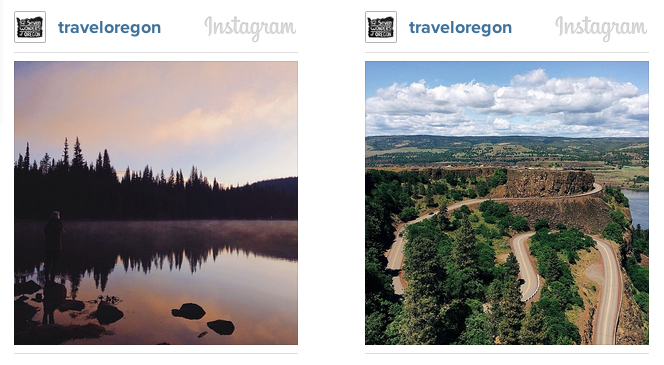 How does the Travel Oregon campaign integrate Instagram? How do you collect the photos and display them on the website? Travel Oregon: One of the newest features for 7 Wonders of Oregon is the integration of Instagram photos into TravelOregon.com. We use Instagram’s API to pull the images tagged #traveloregon that have also been liked by the @TravelOregon account into WordPress. Then, in the WordPress admin, we determine which Wonder to associate each photo with based on geofences around each Wonder. If an Instagram image is geotagged with a latitude and longitude that falls within the boundaries of a Wonder, it automatically gets associated with that Wonder. This allows for linking Instagram photos to individual Wonders from the homepage and 7 Wonders landing page, and to create subsets of photos to display on each Wonder page. While the system isn’t failsafe, if something gets mis-categorized, the editorial team can reclassify or remove images manually as necessary. Why did you decide to focus on Instagram? Travel Oregon: A huge part of this campaign is based on the idea that there is no one way to explore Oregon’s 7 Wonders and no one type of explorer. We wanted to put the paddles, handlebars, ski poles, horse reins and so on in the hands of everyday explorers. Instagram is a great platform for showcasing real-time, first person snapshots of these adventures through a variety of lenses. We saw the influencers as leading by example and paving the path for the type of content we hope to see both Oregonians and visitors capture and share through their unique perspectives. Each of the influencers’ Instagram photos told the story of an Oregon adventure either while experiencing one of our 7 Wonders or while on their journeys to do so. Their complete itineraries captured via Instagram told a larger story of their adventures, while all of the influencers’ Instagram photos together told the even larger story of our 7 Wonders. 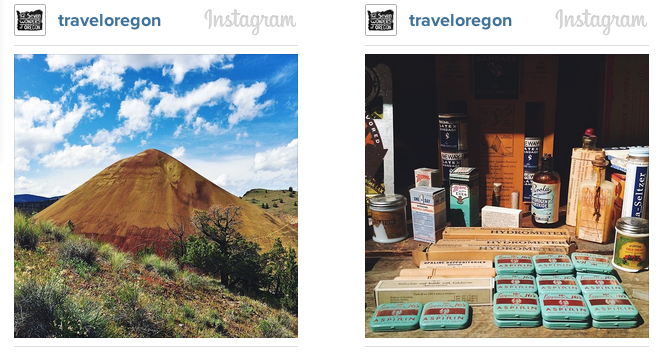 Finally, we see all of the #traveloregon tagged Instagram photos from our followers telling the largest story of all.